Savory sausage and pepperoni smothered with mushrooms, red and green sweet peppers, onions, and of course cheese to create the ultimate satisfying combination that is pizza delightfulness. 1. Preheat oven to 400⁰F. Stretch pizza dough into a ½-inch thickness on a standard sized baking sheet that has been lightly sprayed with cooking spray. 1. Bake pizza dough for 6 minutes. Remove from oven and let cool slightly. 1. Layer crust with the pizza sauce, vegetables, sausage, pepperoni and cheese. 1. Bake for 15-18 minutes, or until the crust is golden brown and the cheese is completely melted. Allow pizza dough to sit uncovered at room temperature for one hour in order to rise. 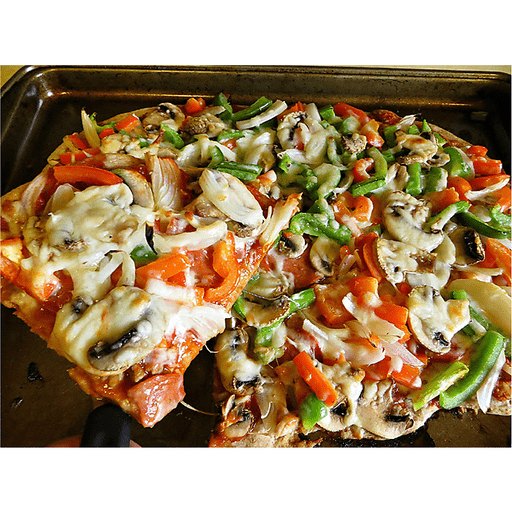 For gluten free: Use pre-baked gluten free pizza crust in place of wheat pizza dough. Calories 450, Total Fat 12g (Saturated 6g, Trans 0g), Cholesterol 40mg, Sodium 1220mg, Total Carbohydrate 61g (Dietary Fiber 8g, Sugars 6g), Protein 27g, Vitamin A 20%, Vitamin C 50%, Calcium 35%, Iron 25% *Nutritional values are an approximation. Actual nutritional values may vary due to preparation techniques, variations related to suppliers, regional and seasonal differences, or rounding.